Apple Chief Financial Officer, Luca Maestri, set tongues wagging when he claimed the company had just set a “new enterprise revenue record”, though he didn’t say why. I thought I’d try to explain it for him. Digital transformation is the dominant story of today – not just in IT, but everywhere else as well. History will show that almost every part of life was impacted by mobile technology, and Apple’s guaranteed place in tomorrow’s enterprise is just one component of this. The iPhone spawned the Bring Your Own Device (BYOD) revolution, one which itself spawned empowered workforces demanding choice: Choice in platform, choice in software, choice in working hours. Flexibility is everything – and it’s generating some weird ironies: retailers don’t run shops any more, they manage “experiences”; customer service is escaping from the call center to develop authentic voices in a sea of bots; conferences are as likely to be virtual as real. Even agricultural production is managed remotely using smartphones. 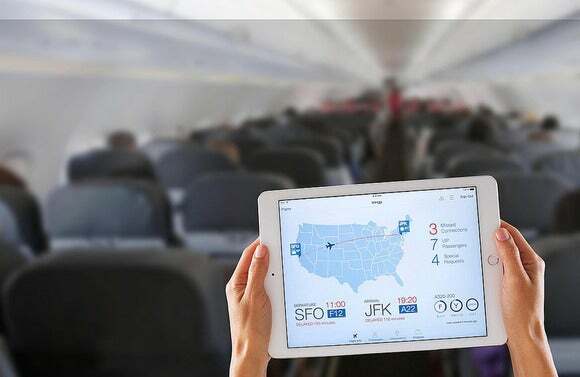 There are iPads in our homes, offices, airplanes and above the sky. We’re connected, and, when it comes to the enterprise, Apple has become synonymous with mobile tech. “Businesses everywhere are becoming digital, software driven, and we believe ultimately - mobile centric. And it's not just consumer services. It's every industry and vertical on the planet,” Rowan Trollope, Cisco’s SVP GM of IoT and Applications Group told me last year. “Apple offers the most innovative mobile technology in the world combined with the world’s most advanced mobile OS,” he also said. According to Good Technology's Mobility Index Report, iPhone accounted for 72% of all enterprise smartphone activations during the first quarter while iPad accounted for 81 percent of tablet activations. The JAMF annual survey reveals similar sets of statistics, with 91 percent of organizations are now using Mac and 99 percent on iPad and iPhone. "All our products continue to be extremely popular and drive more buying transformation in the enterprise market. We set a new enterprise revenue record for the March quarter, and we expect this momentum to continue for the remainder of the year….Corporate buyers reported a 96 percent satisfaction rate and a purchase intent of 68 percent for the June quarter,” said Maestri. There are lots of good reasons that Apple has been able to secure its position in the enterprise. Six easy reasons include Apple’s first mover advantage, ease of deployment and device configuration, Exchange support, constructive relationships with Microsoft, Cisco, Deloitte, IBM and others, and industry-leading lack of fragmentation. Another is the user demographic and their loyalty: While Android-as-a-platform has a larger market share, when it comes to enterprise deployment Apple has the hearts and minds of the high-end smartphone user – and a 92 percent loyalty among those customers. Expense: Based on a major deployment of 90,000 Macs, IBM now claims it costs three times as much to manage Windows PCs as it does Macs. Support: iOS 10 runs happily on iPhone 5, released in September 2012. Other platforms don’t provide support for anything like as long, posing pressure on enterprise IT budgets. Security: Apple’s platforms are certainly not immune to cyberattack – but they are regularly patched and seldom subverted. In contrast, some people claim an example of new Android malware is identified every ten seconds. Partnerships: Apple and its integration partners are securing a range of massive deals, not least the recently announced decision by Volkswagen to standardize on use of iPhones across the corporation (reaching a potential 620,000 employees), and Capital One’s purchase of iPhones, Macs and Apple Watch for employees. Santander Bank just agreed to deploy over 11,000 iOS devices across the company. United Airlines has deployed 50,000 iOS devices. Enterprise sales: Apple’s integration partners are putting tonnes of effort into evangelizing the company’s solutions to the sector. IBM’s MobileFirst iOS strategy continues to bear fruit (around c.3k businesses are now using IBM/iOS apps). Deloitte has assigned a colossal 5,000 people to focus on Apple integrations for its enterprise clients and is working to secure over 100 big new opportunities. Cisco is also working to evangelize Apple in the enterprise. Developers: To boost its enterprise share, Apple is pushing outside of its own sizable developer community. SAP recently released a tool that makes it much easier for SAP developers to write business solutions for iOS. Smaller groups, including WWT Asynchrony, are also climbing aboard. Compromise, and the lack of it: Apple has worked hard to break out of some of the preconceptions levelled against it by critics. It is working with partners, opening up key API’s to enable solutions integration and development, and working to secure its systems and data integrity with improvements such as Apple File System. This means an enterprise user can look forward to the same quality ease-of-use as a consumer can expect from an Apple system, but boosted by security, performance, and integration advantages pros demand. Mobility Partner Program: Apple also has its own scheme in which it works with developers and master systems integrators to weave its solutions into enterprise deployments. iPad Pro sales to enterprise users are on the rise despite the hype around Surface. 76 percent of organizations claim to have seen an increase in iPad and iPhone adoption, 74 percent are experiencing uptick in Mac use across their organization over the previous year. With so many enterprise employees using their devices for both work and play, Apple’s growing services revenue is also likely to see an uptick as the enterprise transformation continues.